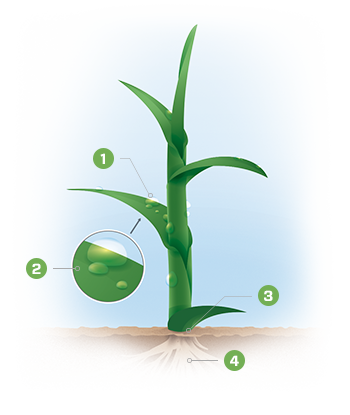 NITAMIN® targeted foliar nitrogen (N) is a patented, liquid nutrient source. It is designed to make some of the N immediately available for quick green-up, while reserving the rest for a steady supply of N to the turfgrass. NITAMIN® foliar fertilizer has a high N content—yet a lower salt index than a straight urea solution—which adds a critical margin of performance, efficiency and safety. Contains a combination triazone, methylene urea and un-reacted urea components. Golf course superintendents and turfgrass managers apply NITAMIN® fertilizer to help improve plant growth and appearance for months without the need for re-application. Plus, this flexible technology provides another option to help customize your fertility programs. Nitrate-N (mg) in leachate collected from a Bermudagrass USGA green at the FLREC in Fort Lauderdale, FL. Both NITAMIN® 30L and urea were applied in 4 split applications at 0.5 lb. N/1000 ft.2 every two weeks for a total of 2.0 lbs. N/1000 ft.2. Application dates: 5/23, 6/6, 6/21 and 7/5. 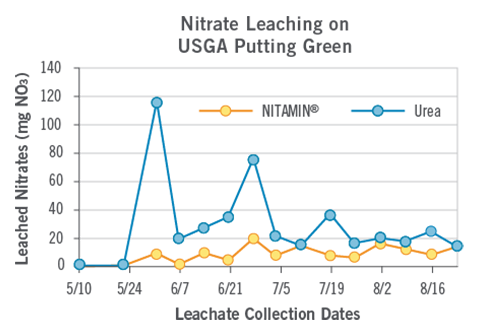 See why NITAMIN® is more effective than a standard urea solution. Although these two solutions were applied to a broadleaf plant, the explanation and visual comparisons are equally relevant when applications are made to turfgrass.